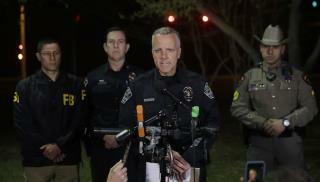 (Newser) – The explosive device that injured two men in Austin on Sunday night appears to have been a different—and even more worrying—kind of device than the package bombs that killed two people earlier this month, police say. Interim Police Chief Brian Manley said early Monday that investigators believe the device may have been triggered by a tripwire, the Austin American-Statesman reports. "It is very possible that this device was a device activated by someone either handling, kicking, or coming in contact with a tripwire that activated the device," the chief said. "That changes things." The three package bombs earlier this month were left on doorsteps and went off either when the package was moved or when it was opened. While we try to understand his motivation, the evil doer will continue to chuckle and laugh, while building more bombs. No one is safe. By now, we should have enough material to ID some of it and begin tracing it. If no one else has the guts to say it...I WILL. We need package control in this country. This can only happen because of easy access to packages and package wrapping materials. The internet needs to be less free also. That's where these freaks learn to make their package bombs. We need more government control of the internet. Never lose sight...the big issue is the packages, not the murderous freak making and distributing them.